We’ve got it covered thanks to our alliance with the Master Locksmiths Association, together, we’ve developed the ERA Approved Partner Scheme. We know homeowners want someone they can confidently invite into their home, trust with home security and who is qualified to do a great job. When you use a member of the ERA Approved Partner Scheme, not only can you be assured the company has been vetted and inspected to deliver all of those things, you’ll also be working with someone who can provide sound advice, recommend high quality products, offer fair and transparent pricing and work within the MLA Charter to ensure customer satisfaction. You’ll also discover that MLA members go far beyond locks – they take a holistic view of the whole house and make recommendations about safety and security. 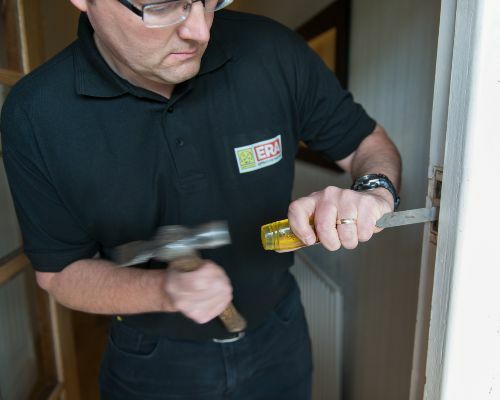 Central to ERA’s partnership with the Master Locksmiths Association is the capability to offer a free home security survey to every homeowner across the UK. The process is really simple – just pop your postcode into the search box and we’ll email you details of your nearest locksmiths along with a voucher code, you book an appointment directly with the locksmith of your choice and, after visiting your home, you’re given advice specific to your property and in line with the very latest home security guidelines and regulations. Look out for the MLA Approved company logo and be sure to take advantage of ERA’s free home security survey.